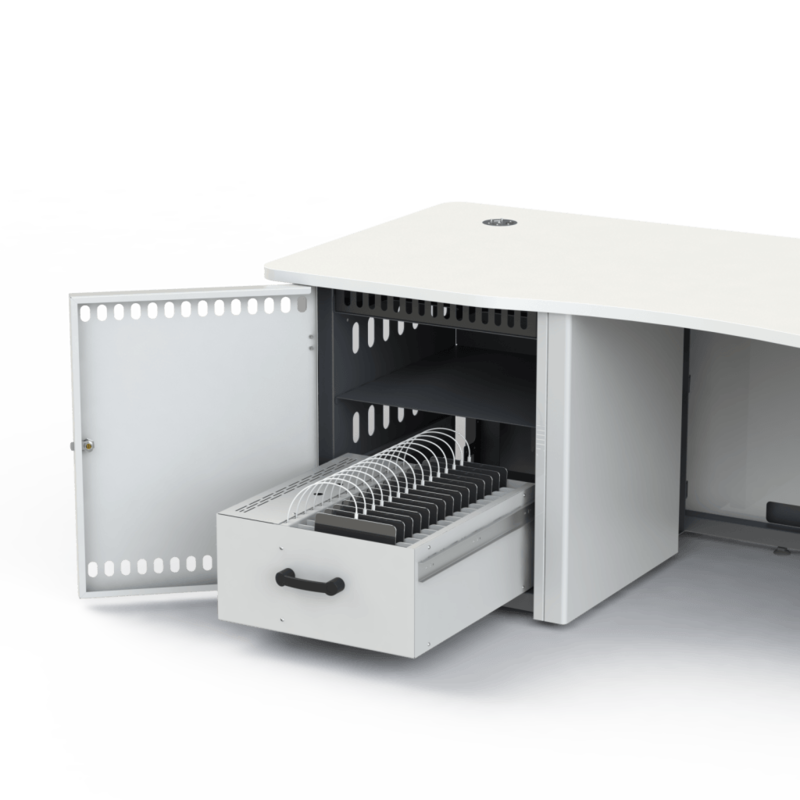 The Command Desk™ offers intelligent control of your working environment with secure storage for all your equipment within the desk itself. 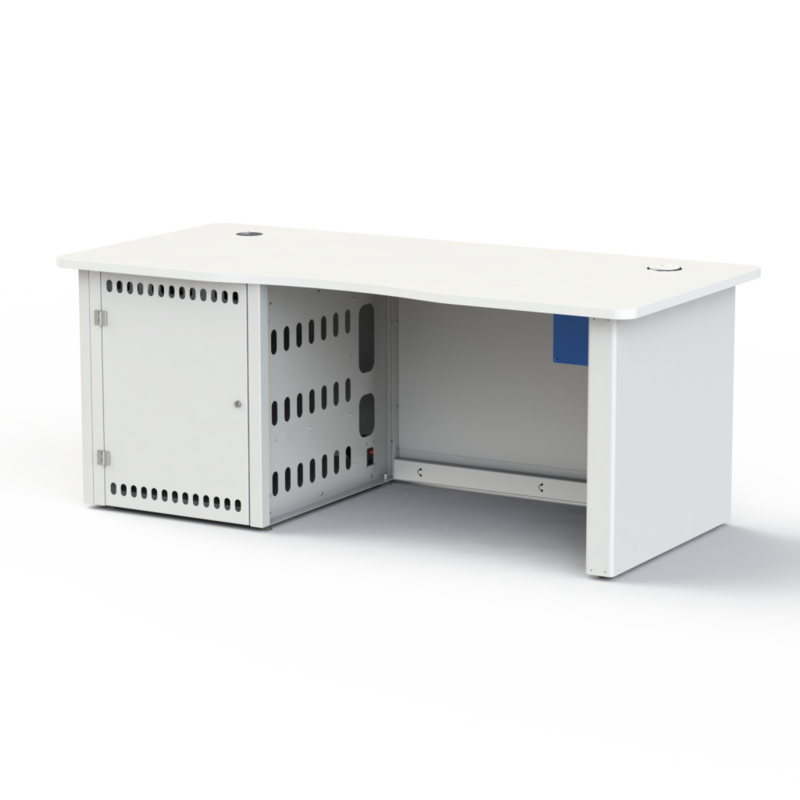 House your AV equipment within the easy access 12U 19″ lockable cabinet. 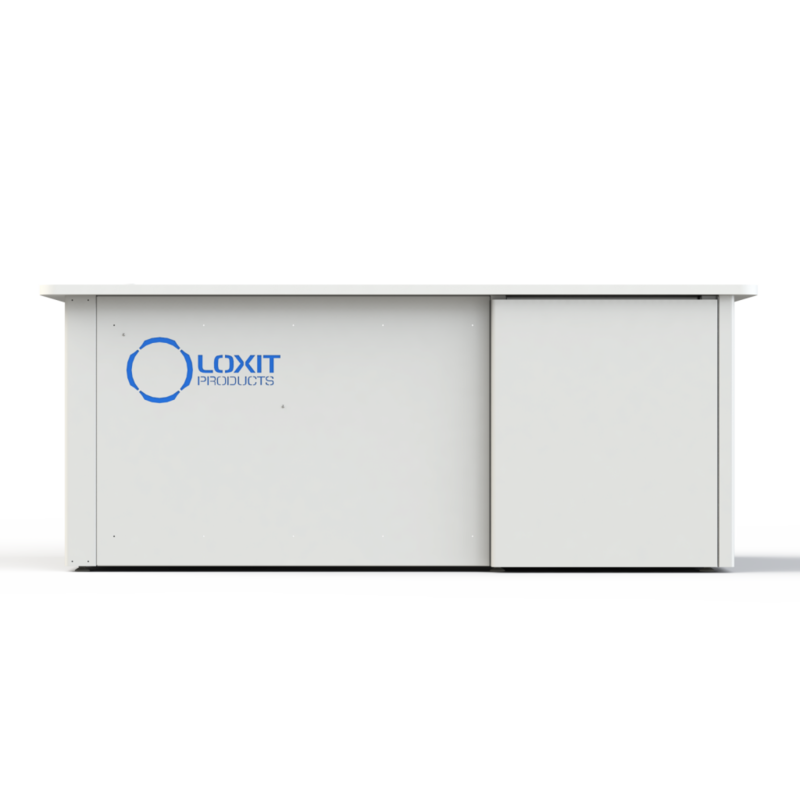 Designed for subtlety, the Command Desk™ solution is a powerful and capable fully integrated AV desking solution. To keep things simple, there’s just one single switched and fused power point with 4 IEC outlets to power peripherals and PDU’s, keeping everything neat and tidy. We offer a selection of colours, desktop shapes and other technology specifications. If you don’t see what you’re after, just ask, we are experts in our field, providing countless bespoke solutions that integrate technology and equipment around your needs. 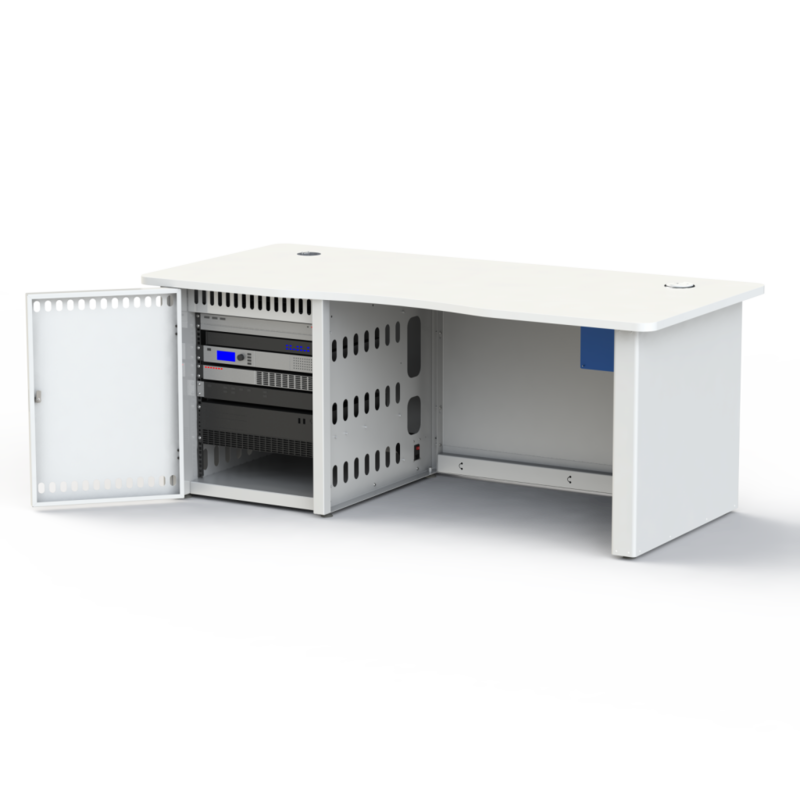 The prefect solution to control the AV environment from a single desking solution. The integrated 12U AV cabinet provides an AV hub which allows total control of the AV environment. 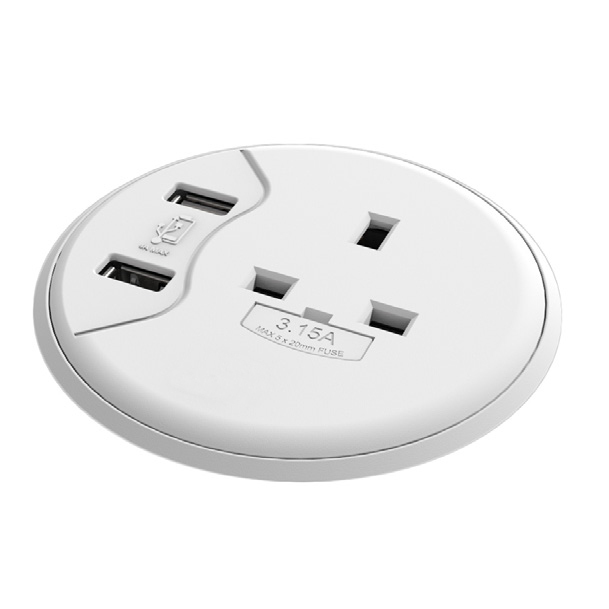 Choose from a range of optional integrated accessories, including VGA, USB, HDMI and CAT 6 faceplate grommet. Complete connectivity to all aspects of AV neatly and effortlessly from the Command Desk. 2000mm wide, 750mm high, 850mm deep. Perfect for lecture theatres and large rooms with integrated AV where presentation to large audiences require specialist integration. 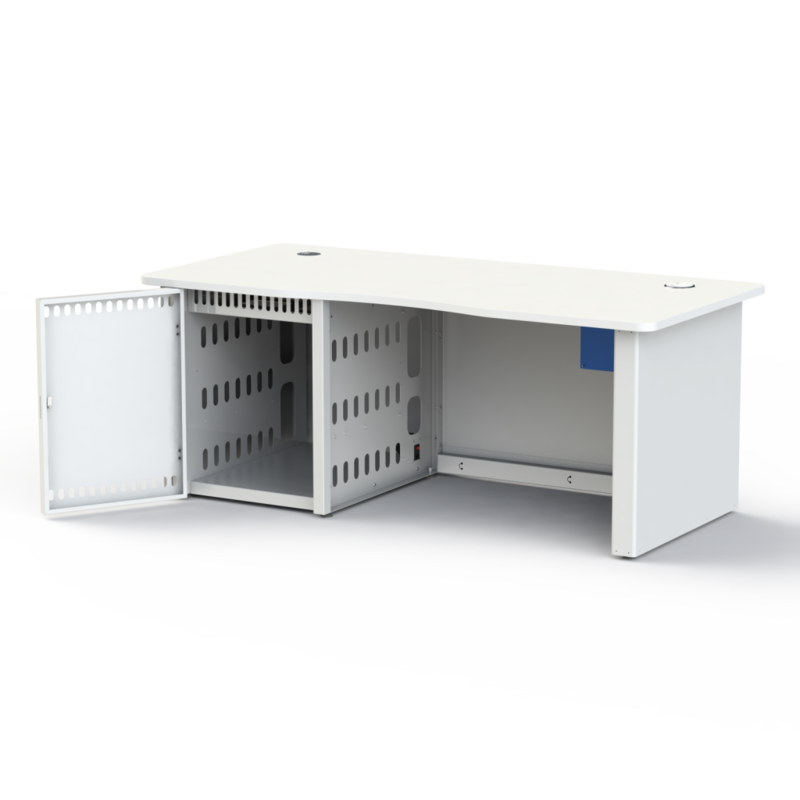 The integrated lockable 12U cabinet includes 4 IEC outlets for power distribution. 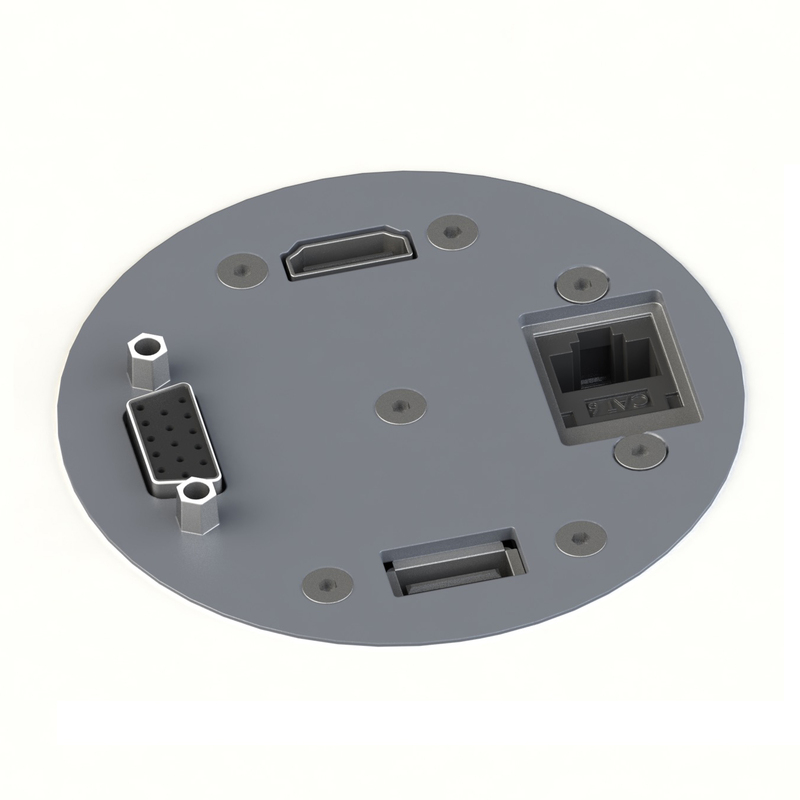 The optional AV Grommet Faceplate allows simple and doable connectivity to your AV system via VGA, USB, HDMI and CAT6. 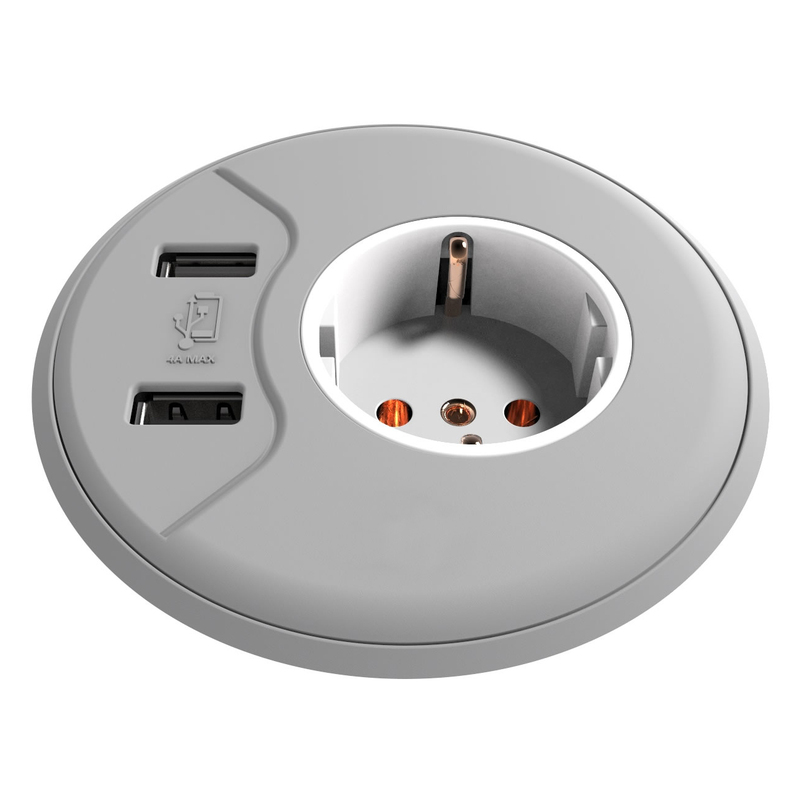 The optional Device Power Grommet provides convenient power for your laptop and 2 x mobile USB chargeable devices, neatly located on the desktop. 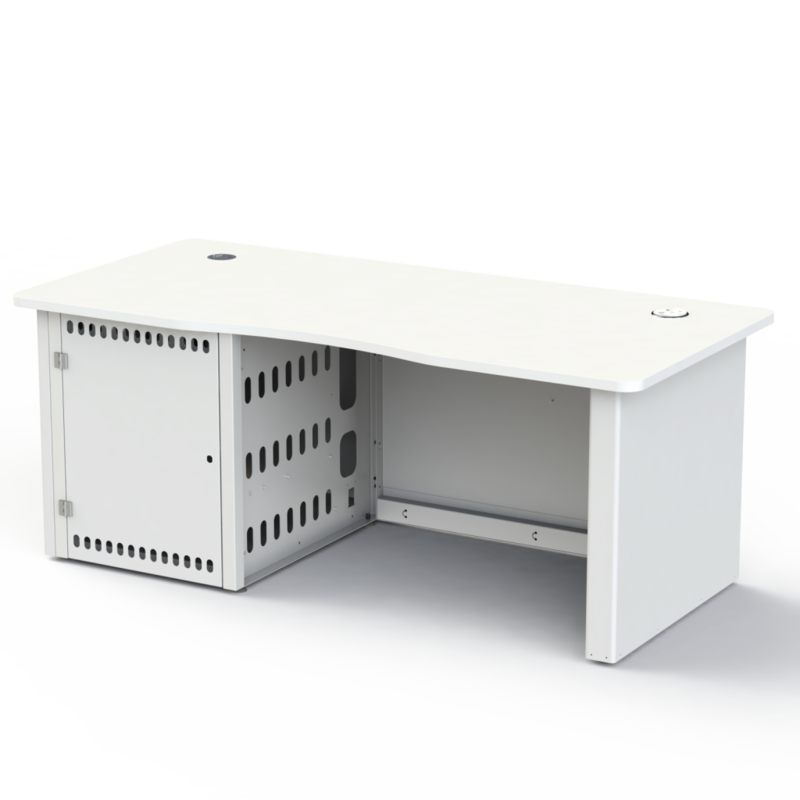 The Command Desk has a 5 year warranty. This is a return to base warranty. If outside the U.K. please contract your local partner/service centre. Please note: When ordering multiple items, delivery charges may change. 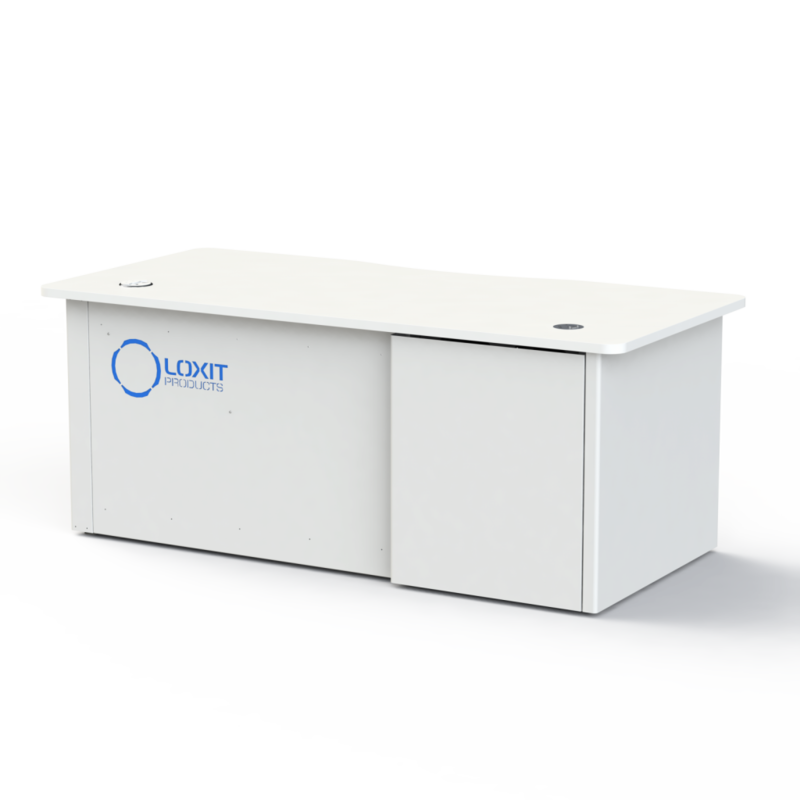 Presentation Media have been working with Loxit for almost 10 years now and have found the products to be of excellent quality.The staff have always given us a quick and professional service with amazing support.Often accommodating and are always open to new suggestions for product ideas. Striving to provide the latest technology, improving audio visual requirements now and to last the future needs of our customers.